Phosphorus is a major mineral which works closely with calcium to build our bones. 85% of body’s phosphorus is found in bones and teeth. The remaining 15% is found in various components which aids in bodily functions. 1. Works closely with calcium to build our bones. 2. As a component of enzymes aids in energy, protein and fat metabolism. 3. Build strong bones and teeth. 4. Helps is protein synthesis being a part of deoxyribonucleic acid (DNA) and ribonucleic acid (RNA). 5. Acts as a buffer – helps to neutralize the acids and maintain pH levels in the body. 6. It works with B vitamins to maintain normal heart rate. 7. Maintains muscles and blood vessels. A deficiency of phosphorus can lead to a drop in energy and thus weakness and fatigue. Prolonged deficiency will result in brittle bones as well as joint and muscular pain. The recommended dietary intake of phosphorus is 600 mg / day for an adult, 1200 mg for a pregnant women, 600 mg / day for kids upto 9 years and 800 mg / day for kids from 10 to 18 years. Since it is available in a variety of foods, deficiency of phosphorus is not very common. 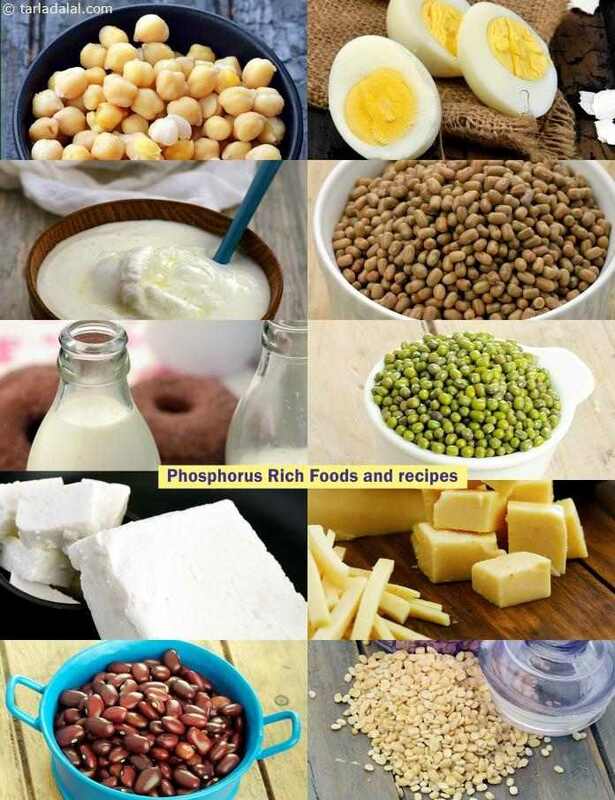 Use these phosphorus rich foods to create delicacies like. in your own kitchen and welcome health for your family.